Our service is always quick, friendly, and professional right across the county, whether you require a domestic service in Shepshed, regular commercial waste management disposal services for your Loughborough business, or complete one-time house clearances in Oakham. 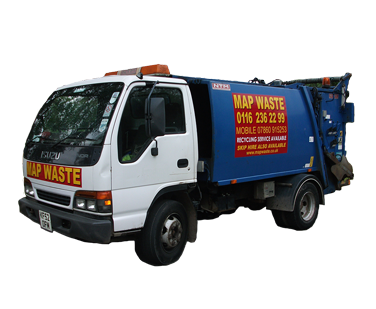 Map Waste offers you a wide range of waste collection equipment. 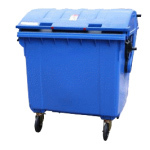 We can even provide next day delivery of our range of waste bags and 240, 360, 660 and 1100 litre bins, all with no rental charges, in Melton Mowbray, Coalville or elsewhere, as our service extends across Leicestershire from our base in Anstey. Add to this our vital ability, in certain key situations, to handle confidential waste, with shredding, incineration and other processes available to ensure documents and materials are effectively destroyed. Of course we also offer an extensive range of recycling services for wood, cardboard, and paper waste disposal. With the opportunity for daily, weekly or fortnightly collections, you’ll soon appreciate just how effectively Map Waste deals with all of your waste removal and rubbish clearance needs. With the experience of almost three decades in this business, our family-run Leicester based waste removal company is ready to deal with any level of waste disposal needs from commercial business complexes to small shops, extensive retail outlets and even factory clearances. Our invoicing system is also as streamlined as you’d expect, making the choice of Map Waste a simple and sensible one to take. We know this because many of our long-time customers have been kind enough to recommend us to colleagues, business acquaintances, family and friends. So, how can we best help you with your business or domestics rubbish clearance or waste removal needs here in Leicestershire? If you have any questions, or want to discuss your specific situation, please call our friendly and helpful team on 0116 236 2299. You can also email with the details, or request a free swift and no obligation quote by clicking the Quick Quote box at the top of this page. 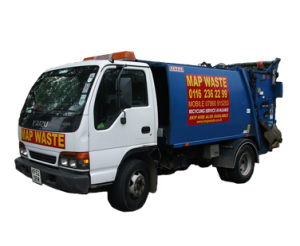 From bags to bins, Map Waste professionally collects and effectively deals with whatever you want to dispose of – so contact us now.